Economies function like living organisms, to a certain extent. To survive, a living organism must adapt to its climate. The same is true for an economy. In 2018, the economy – of which the job market is the backbone – is an entity in the early stages of adaptation. This is abundantly clear in the CareerCast.com Jobs Rated report on the 10 best jobs of 2018, which features up and coming professions that were not included in the first Jobs Rated list three decades ago. Each year, the Jobs Rated report adds new careers to the evaluation process in order to provide the most accurate representation of the job market. Older, sometimes archaic careers are dropped to make room. This year, the full Jobs Rated report expands to 220 job titles for the first time, simply because the influx of important, new fields in the labor market is so abundant. And many of the new job titles added to the Jobs Rated report in recent years rank among the American economy’s very best. The jobs landscape has rapidly changed in the decade, and continues to evolve at a pace commensurate with revolutionary periods in our history. For example, the Industrial Revolution of the late 19th century into the early half of the 20th century moved America from an agrarian society to a culture dependent on manufacturing. In the 21st century, we are increasingly reliant on technology for day-to-day living. The best jobs of 2018 reflect this ongoing shift, with careers in tech or directly tied to tech represented. Mathematician and Data Scientist are two examples of the latter. While not specifically tech jobs, high growth outlook and impressive pay are the result of changes in technology fueling job prospects for both professions. Mathematicians and Data Scientists both can find lucrative opportunities in the tech space parsing and analyzing collected data. On that same front, demand for Information Security Analysts is driven by the need to protect internet users’ personal data. The advancement of technology is also apparent in another industry undergoing constant and dramatic change: Healthcare. The best job of 2018, Genetic Counselor, is in healthcare, and owes its exponential growth to technology. Advancements in genomics fuel the growth of this line of work. Genetic Counselors work with patients expecting children to assess and evaluate risk of genetic disorders and birth defects. They also advise patients at risk of congenital disorders. The National Society of Genetic Counselors estimates that since 2006, the field has grown by 85 percent. The U.S. Bureau of Labor Statistics estimates growth by another 29 percent in the next eight years. Preventative care, akin to the services a Genetic Counselor provides, is helping to shape the future of healthcare. With more Americans having access to healthcare, including preventative care, than at any other time in history, providers face challenges on the business side. Medical Service Managers help address those challenges. The No. 6-ranked job among the 10 best jobs of 2018, Medical Service Managers earn typically high pay (median annual income of $96,540) with a growth forecast of 20% by 2026. They work in various capacities of the business side of a healthcare provider, ensuring budgets are met and finances are in order. Medical Service Managers oftentimes work with healthcare’s auxiliary professions, including Jobs Rated best jobs regular, Actuary. Another job among the 10 best requiring an educational background strong in mathematics, Actuaries use statistical data to evaluate risk, and the potential economic impact associated with certain risks, largely in the insurance sector. Indeed, education is paramount to keeping pace with the rapid rate of change seen in the labor market. 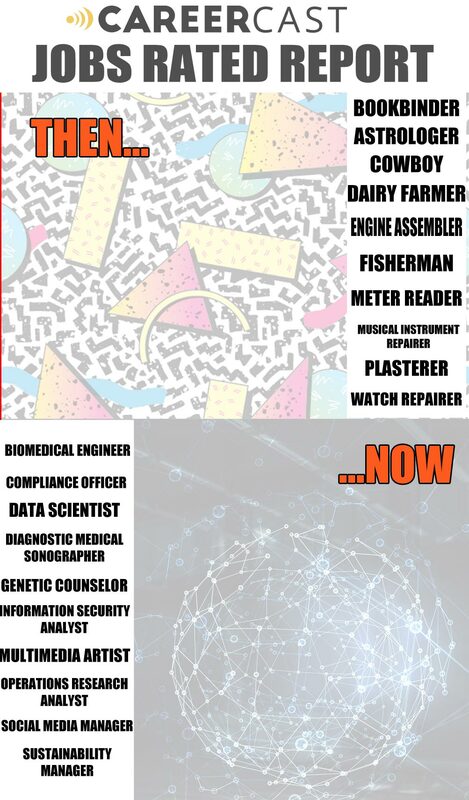 Desired skill sets are constantly changing, necessitating education for career advancement later in life, especially compared to previous generations. Recent estimates published by the National Center for Education Statistics project that almost half of the student body population across America’s colleges and universities in 2020 will be over the age of 25. Postsecondary education is now as much about career development as career preparation. University Professors rank among our 10 best jobs in part because of the central role they play in shaping this changing job market.